When I was about Calvin's age, shortly after I had learned how to swim, I went with my family to the summer league A championships. At the time I was a B class swimmer, fast enough to earn a gold B champ medal in the 25 yard breastroke but not fast enough to compete with my siblings in the more esteemed A meet. The competition was held at an outdoor facility that had two pools, one roped off with blue and white plastic lane-lines for races and the other used for warm up and cool down. This second pool had a deep end for diving where I was passing the time frolicking in the cool blue water with some of my teammates. One boy, who was a year—maybe two—older than I, was hanging onto the edge next to me. For no apparent reason he slapped his hand—elbow up—on top of my wet head and dunked me under, palming my skull like a basketball. Reaching up, my fingers were mere inches from the rounded cement lip of the pool. I scraped and scratched at the slippery tile wall as if I were sealed in an aqua blue coffin, no one knowing my terror but me. 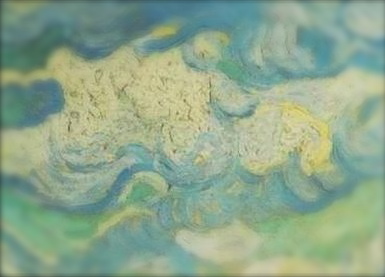 Looking up, as my bubbles ascended then boiled at the surface, I saw a blurry Van Gogh sky, swaths of painterly blue and white eerily rippling at my frenzied fingertips. I was petrified and too panicked to understand that if I dived deeper I could escape the boy's grasp and pop up safely a few feet away. I was out of control, completely at the mercy of this wiry bully boy. He released me, just as my lungs had begun burning in my birdlike chest. I scrambled up and sprung out of the pool panting, never to get within arm's length of him again. I wonder if Calvin feels this same sense of panic, hopelessness or fear when he is having a seizure. Does his vision of the world warp and blur? Does he feel as if he is drowning, unable to take in air to sooth his burning, collapsing lungs? Do his muscles cramp and leaden? Does he try in vain to cry out for help only to be smothered by the suffocating torrent, the bully dunks that relentlessly seize his brain? Though I don't really believe it, I can only hope that he simply sees and feels a beautiful Van Gogh sky. Have a great weekend. You are a lovely writer and I enjoy reading about your life with Calvin. Only because I know so many people have no clue what it is like to raise an epileptic child. Calvin didn't ask to be born with so many problems but he lucked out with a great set of parents. I hope he gets well enough to learn to enjoy some summer time spent at the pool too! I expect you are probably already on this technology but it is a cool article about new stimulation technology of the vagus nerve.